The days are getting warmer, but there is still a chill in the air in the evenings. Rather than putting the heating on at this time of year, there’s nothing like lighting a fire on a stormy or chilly night to make your home feel warm, dry and cosy. If you have children or pets in your home, however, lighting a fire may concern you as the bright flames can prove to be an attractive draw, encouraging the inquisitive to come closer. With an open fire, there is also the fear of pieces of wood or coal spitting out on to the carpet or rug. What should be a warm and comfortable environment becomes potentially hazardous. A fireguard can help you to enjoy a fire without these worries – it will stop sparks spitting out on to a rug and keep people away from the fire. But – you may feel – too often fireguards are practical yet unattractive, folding models and will mar the look of your stylish room. Our hand-woven fire guards, on the other hand, are both functional and visually appealing. They offer attractive and authentic protection for an open fire as well as a guard for a wood burning stove. Inspired by beautiful and practical examples from the past, our range of fire guards will enhance, not mar, the look of your hearth. 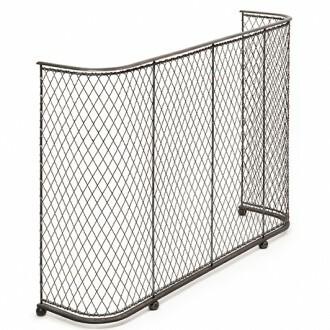 For peace of mind and a stylish addition to your décor, our fireguards are the perfect choice.